11. Should I hire a contractor? Whether you're sprucing up the house to sell it faster or you just want a nicer kitchen, this site helps you compare the time and cost of doing a project yourself vs. hiring a local contractor. It's run by Gene and Katie Hamilton, who have written 20 books on remodeling; they collect data from retailers and contractor price lists. You'll find, for example, that in Chicago it's $1,218 cheaper to install your own kitchen cabinets than to have a pro do the job. Caveat: No Web site can tell you whether you are competent to install those cabinets. Consult your spouse. 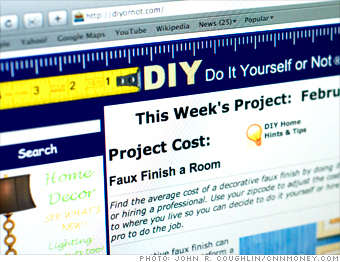 Try this too: Doityourself.com gives step-by-step instructions on how to complete hundreds of home projects, from repairing a noisy air conditioner to shingling a roof. NEXT: 12. Who are the best doctors in my network?